This article is a tutorial covering basic configuration setups for the rxvt-unicode (urxvt) terminal. A user can enhance the look and performance of the terminal by setting environment variables and resources; these settings are controlled through existing and additional configuration files. Features such as font and font size, transparency, tinting, scrollback buffer size, and scrollbar placement can be set by editing small plain text files. This tutorial gives a brief description of the Rxvt-Unicode terminal, a basic terminal environment setup, and the creation of the .Xdefaults configuration file. Rxvt-Unicode is a terminal emulator for the X Window System. It is based-on rxvt version 2.7.11, and provides Unicode, pseudo-transparency, shading, tinting, backgrounds, embedded perl support, and many other options and features. Since version 8.3, it offers full support for AfterStep's libAfterImage library. Rxvt-Unicode has replaced aterm as the preferred terminal emulator for the AfterStep window manager; it offers more features and makes no sacrifices in terms of performance. For a complete feature list, downloads, and detailed documentation, visit the Rxvt-Unicode WEBSITE. A note on aterm: Although aterm has served its demanding users very well, it has one shortcoming: aterm does not support Unicode. The number-one requested feature submitted to the aterm development team has been for Unicode support. Implementing this support isn't practical, as much of the aterm code would need significant rewriting; the end product wouldn't offer the light, fast terminal that users expect. aterm development has merged with rxvt-unicode; aterm is currently maintained, but future development work is targeted to rxvt-unicode. While not a requirement to run Rxvt-Unicode, libAfterImage adds additional features and performance; libAI support is enabled as default with the Rxvt-Unicode distribution. Supported image formats include: BMP, GIF, ICO, JPG, PNG, SVG, TGA, TIFF, XPM, XCF, and AfterStep's XML image script. libAfterImage version 1.15 (or AfterStep 2.2.7) or subsequent versions are required for use with Rxvt-Unicode. To view libAfterImage's features and documentation, or to download its source code, visit this WEBSITE. 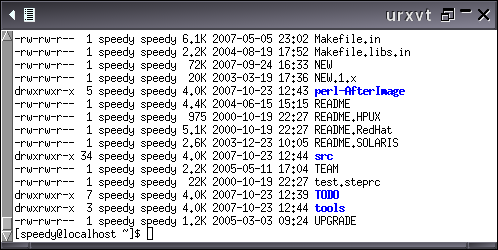 The AfterStep window manager can be found on this WEBSITE. Before configuring Rxvt-Unicode you need to setup some tools and environment variables. 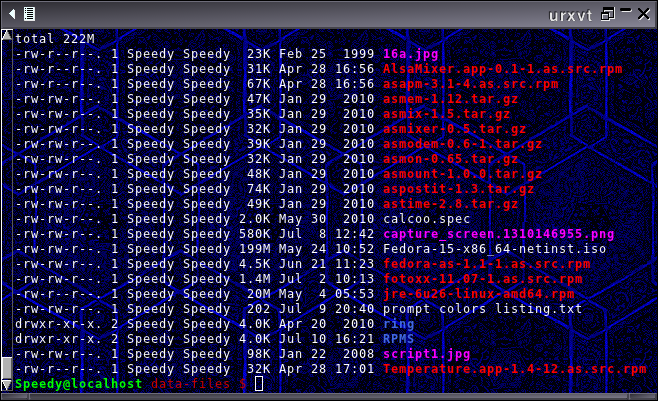 A terminal visually benefits by having colored folders, files, and a command prompt; folders stand-out and are distinct from files and the prompt is readily visible. Open a terminal and type "ls -l", verifying that folders are colored differently than files. Check that the prompt is a distinct color. If you aren't seeing multiple colors, you will need to modify the ".bashrc" file. To implement colored folders and command prompts, edit the ~/.bashrc ($HOME/.bashrc) file, located in the user's home folder. Close the terminal and reopen it. Use the "ls -l" command again. You should see a colored prompt and folders. and substitute your language of preference on the "export LANG=" line. Creating or modifying the .Xdefaults file is the final step in configuring Rxvt-Unicode. Once this file is edited and saved, all subsequent launchings of the Rxvt-Unicode terminal will contain the aforementioned settings. The .Xdefaults file contains all of the terminal specific settings for Rxvt-Unicode. Xterm settings and other application settings can go in here as well. This .Xdefaults example shows data for urxvt; you can either append this data to an existing .Xdefaults file, or append additional information to this file. The following settings are very basic, and should be enough to make the terminal functional and visually pleasing. For more settings, please read the urxvt man page or read the "Terminal Configuration" portion the the Rxvt-Unicode FAQ HERE. Both the listing above and below are the same file functionally. The listing below simply has comments added for reference. Cut and paste either into ~/.Xdefaults. #   Don't use with tintColor; just use a darker or lighter color instead. #   alias ls="ls -h --color=auto"
- You can't use the colors "white" or "black" as tinting colors; in terms of tinting they equal "none" and you'll get no tint. - Tinting with gray(s) is equivalent to shading; use the Shading option instead. - Don't use tinting and shading together; it uses unnecessary resources. Just select a lighter or darker color for tinting. HERE and HERE are some nice charts with plenty of colors to choose from. This page was last modified on 20 February 2012, at 14:30. This page has been accessed 189,206 times.